Philadelphia artist Laurie Cooper is known for her striking images of Face Realities. 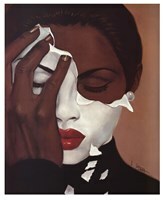 A face of a Black woman wearing a white mask, with obvious shame or agony on her face while the mask is partially shedding off her, is compelling enough to launch discussions and bring in different points of view. In the male version of Face Reality, the man shows apparent anger in his face at wearing the white mask and is peeling it off - more liberating, as the artist describes the whole Reality series to be a process of liberation. 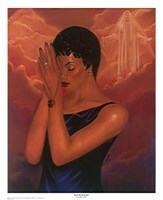 Although the Face Reality series are more racially charged images, according to Cooper the first and original Reality piece had more of a spiritual meaning for her - the shedding of the old self, in the Christian sense. Cooper went to the University of Arts for her bachelors and received her master's degree in Fine Arts from the University of Pennsylvania. 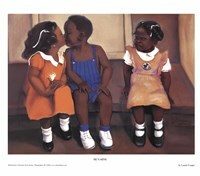 After that, she has been publishing prints with Collectible Art and Frames, publisher and distributor of popular African American art, located in Center City Philadelphia. Cooper's artistic activities started early on as a little girl - she always drew. She first worked with charcoal, then discovered pastel, which she absolutely fell in love with. Pastel is her main medium: "when I get a image in my head I have to pursue it, get it out of my head quickly and put it down somewhere. With pastel you know immediately if it's going to work or not, and I like that immediate, gratifying result. It's more visually stimulating right from the beginning, and as an artist I need that visual stimuli from the very start," says Cooper. 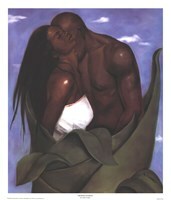 She also likes working with pastels because it is "the cross between drawing and painting. I love those two worlds marrying, and being able to lean heavier toward one or the other depending on what mood I want to create." For the past couple of years her main theme has been the mask; aside from the Face Realities, she has another body of work that are in the same line of mask images, but in a more mysterious and "off-the-wall" kind of way. These are huge (30x40') images of of masks imposing in the center, just floating in the sky and flaking or cracking away. These images embody what she likes to have in her artwork - that element of mystery and fantasy, something that is not ordinary or common, something that might lead you to walk into a totally different world as you look at it. She likes the juxtaposition of more regular, ordinary kind of background with something totally striking and different - almost out of place - that it draws you and makes you wonder, taking you to "that mysterious place everybody goes to in their head sometimes." In the future Cooper intends to drift away from the mask theme. She plans to do figures in large fields (in line with the face in sky images), and angels. She wants to experiment with different methods portraying the other-worldly beings - not by just giving them wings and white clothes but by playing with different colors and scales.